You may know that it’s popular among grooming shops to use blow dryers on pets after they receive a bath. But do you know all the benefits that come with it, besides just getting your pet dry quickly? 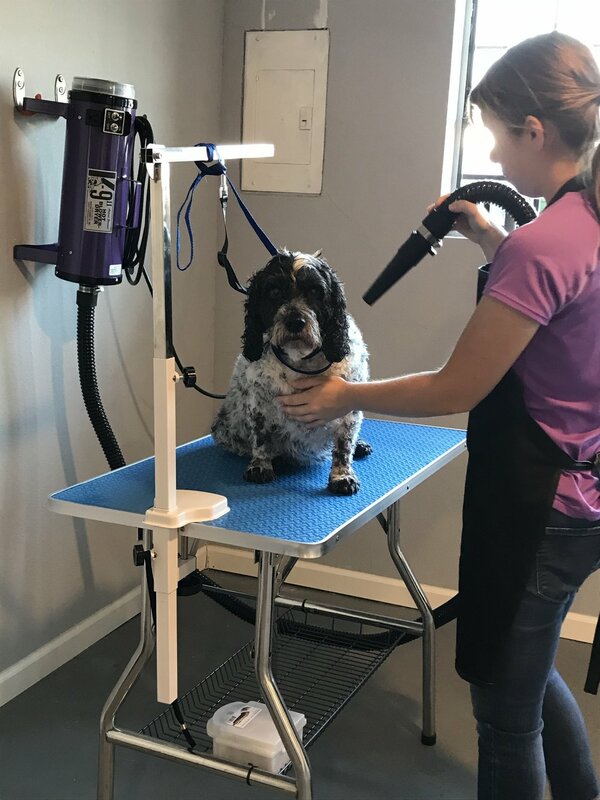 At As the Fur Flies, we will work with you and your pets needs, and if they are unhappy about blow dryers and loud noises, we will towel and air dry them. However, we try to use the blow dryer as much as we can, because it really does make a difference in a fluffy coat after a bath. Safety and comfort-level of your pet is very important to us, and we take it very seriously. We keep constant check on the temperature of the air blowing out to make sure it never gets too hot on your pet. We try to imagine as if we were blow drying our own hair and how we constantly move and switch positions of where the air is blowing on our skin, so as not to burn ourselves. It’s the same with our pets! They just can’t talk and let us know when it gets to be too much, unfortunately. It’s also good to start slow and ease them into it, especially for first timers. An additional benefit to quickly getting your pet dry, is that it really helps to fluff up coats, and start the de-shedding process! On dogs like poodles, blow drying really helps to straighten out their coat. In turn, they look and feel more fluffy, and it’s easier for us to give them a beautiful, more accurate haircut! On dogs and cats with longer hair, like Golden Retrievers and Persians, the pressure of the air blowing out is very productive in up-rooting the under coat and helping get rid of that extra, unwanted hair! It makes everyone’s life easier when we don’t have to brush out as much, too! Here at As the Fur Flies we are dedicated to keeping you and your pet happy, and their coat looking and feeling it’s best! Your house and furniture might be grateful for the regular maintenance of the blow dryer, as well!